Two cane toads have been found in Rosenthal Street in Campbell. It is thought they were most likely accidentally transported to Canberra from Queensland. It is highly unlikely a cane toad population would establish here due to our cold winter climate – and water temperatures are too cold at the moment for them to breed – but they could survive in our warmer months. Cane toads pose a threat to native and domestic animals due to their toxicity. They can also out-compete native species for food and habitat. ACT Parks and Conservation is working with residents in the surrounding area to get information about how the cane toads got to Canberra. We also encourage members of the community, particularly within Campbell, to keep a look-out and to be mindful of their pets. If you have any concerns please contact your vet. 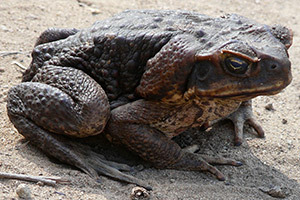 Cane toads are large (about 10-15 cm long) with dry warty skin. They have a bony head and over their eyes are bony ridges that meet above the nose. They can be grey, yellowish, olive-brown or reddish-brown and their bellies are pale with dark mottling. 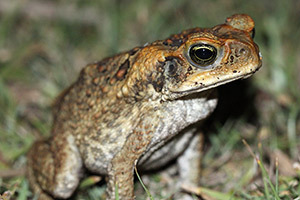 The NSW Office of Environment and Heritage has a useful website with more information on identifying cane toads. phone Access Canberra on 13 22 81. 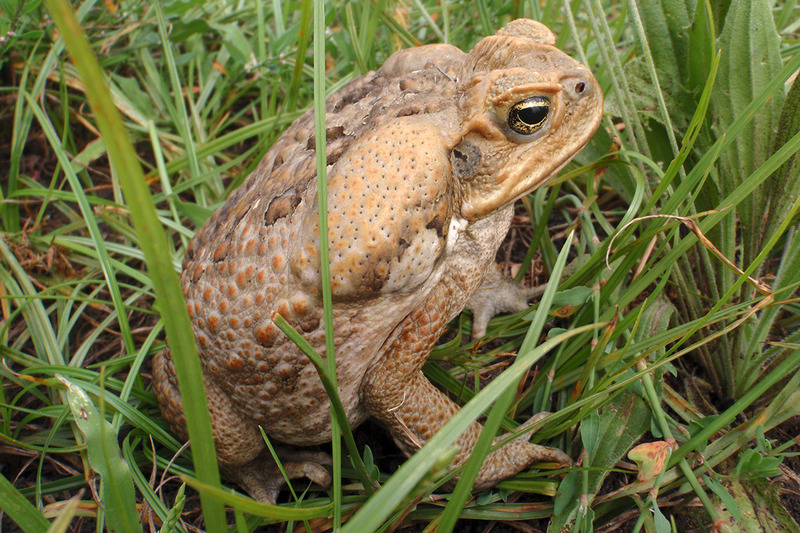 What threats do cane toads pose? they compete with native species for both food and habitat. they are toxic at all stages of their lifecycle from eggs to tadpoles to adults. Their toxin is strong enough to kill most native animals that prey on frogs or toads and their eggs, such as birds, other frogs, reptiles and mammals. their toxicity means they pose a threat to pets such as dogs and cats. their appetite means they eat large quantities of insects. 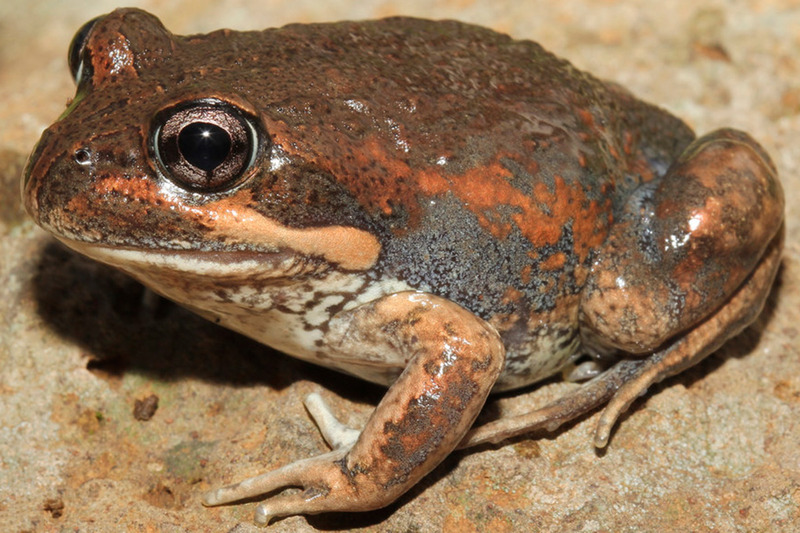 They also eat native frogs, small mammals and even snakes. they have the potential to carry diseases which can impact native wildlife. How can we stop future incursions? People travelling from Northern Territory, Queensland and northern NSW should be vigilant they aren’t accidentally relocating a cane toad. Cane toads can get into vehicles, caravans, camping equipment, farm machinery and landscaping material such as pot plants, mulch and pallets. We all have a shared responsibility when it comes to biosecurity and keeping our bush capital safe from threats. Cane toads were introduced into Australia from America in 1935 as a means of controlling pest beetles in Queensland’s sugar cane industry. They have progressively spread across Australia ever since.